How a city gets built often depends on the course of the markets — but choices made by the city government can alter the course in dramatic ways. At Monday's Spokane City Council meeting, the council passed several ordinances intended to spur DENSER DEVELOPMENT and improve neighborhood centers. For years, City Council President Ben Stuckart says, the city had offered 12-year, multifamily tax exemptions that were supposed to catalyze the development of affordable apartment housing. The problem, Stuckart says, is that nobody wanted to take them. The strings attached — set aside a fifth of the property as affordable housing for those making only 50 percent of the Spokane average income — made the prospect unprofitable for developers. On Monday, the council voted to dramatically weaken the income requirement, raising the affordable housing definition from 50 percent to 115 percent of the median income. The change also made the Mission Street and Division Street corridors eligible for the tax exemption. "I think it should have a dramatic impact on the ability of projects to pencil out for developers," Stuckart says. "I'm hoping so." Additionally the council also voted to approve an ordinance allowing structures in residentially zoned neighborhoods that had once been used for a commercial business — like an ice cream shop or bakery — to once again be used as a business. The change has had an immediate impact, Stuckart says. Someone likely trying to steal copper piping from Greater Spokane County Meals on Wheels tore a spigot off the administrative building near Sprague Avenue and Pines Road in Spokane Valley, causing FLOODING in the early hours of Monday morning. "It looks like somebody hooked it up to their bumper or something and pulled it, hoping to get about several feet of piping," says Mark Laskowski, assistant director of the organization, which provides meals to about 1,000 seniors throughout the county Mondays through Fridays. At most, they got a few inches of pipe, and it's unclear who might have vandalized the property since there isn't surveillance equipment, Laskowski says. Luckily, an alarm system went off when the water pressure dropped around 2:30 am on Monday, but water still flooded the facility — including volunteer space, a pantry and an office area — for hours, leaving puddles about a half-inch deep, he says. The organization was still figuring out the extent of the damage with its insurance company on Tuesday. It appeared that the only damaged items, aside from the rented building, were some donated books, clothes, and packing materials, he says. The organization is going to have to come up with $1,000 to pay its deductible (for comparison, about $100 can feed a senior for a month), Laskowski says, and this is only the latest setback this year. Earlier in the summer, someone repeatedly siphoned gas and cut fuel lines on vans used to transport hot meals while they were inside a fenced area at the organization's kitchen near North Crestline Street and East Main Avenue. After years of anticipation, 60 students started MEDICAL SCHOOL on Washington State University's campus in Spokane this week. The inaugural class of medical students represents a signature achievement for the university, which fought for years to be able to open its own medical school. The University of Washington used to partner with WSU to offer medical education in Spokane, but the two parted ways in recent years. The UW partnered with Gonzaga University, welcoming 60 medical students to Spokane last year, and the WSU Elson S. Floyd College of Medicine followed suit this week. "It's kind of a dream come true," says John Tomkowiak, founding dean of the Elson S. Floyd College of Medicine. The medical school held a ceremony on Friday, Aug. 18, to welcome the inaugural class before classes started the following Monday. All of the students have some connection to Washington state — either they were born in Washington, have a parent who is a resident, spent their childhood in the state or attended a Washington high school. The medical school's mission, partly, is to help address the doctor shortage in Washington affecting rural areas of the state. Recruiting local students, the thinking goes, will help address that shortage. The strategy of recruiting Washington students will continue in the future, Tomkowiak says. 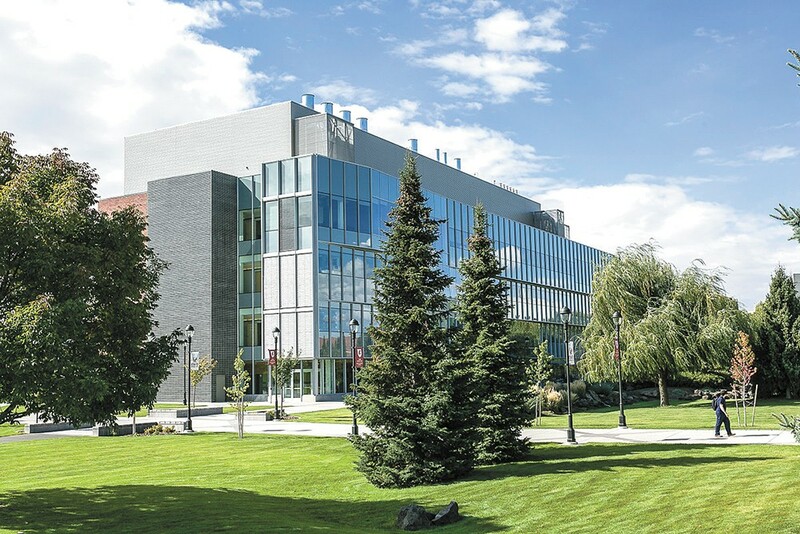 The 60 first-year students will eventually split up by their third or fourth year of medical school into four separate WSU campuses, located in the the Tri-Cities, Vancouver, Everett and Spokane. Already in the first week, Tomkowiak says that students are moving fast. They've organized a government structure for their first year, and they're engaging with the curriculum on the iPads given to them by the school.